In today’s uber-competitive online world, people are using every tool in the book to try to improve website conversions. I am going to show you one tool I have been using that has helped me increase my newsletter signups by 136% in one week. Not only that, but this tool also helped me DOUBLE my Adsense earnings from one of my niche sites. Before I tell you about heatmap testing, I must explain the purpose of testing: to increase website conversions. Website conversions can mean different things for different web sites. A conversion occurs when a desired action is taken by the visitor. On blogs, for instance, a conversion could be achieved when someone subscribes to your RSS. For an eBook sales page, the conversion might be collecting an email address. On an e-commerce website, the sale of a product is a conversion. Obviously, the goal of any well planned website is to continuously track and improve conversion. This is done by monitoring how visitors interact with the web site. Google Analytics provides several good tools for tracking conversions, but perhaps one of the best tools I have come across is heatmap testing. 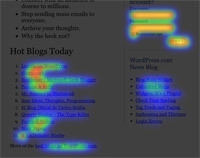 The point of using a heatmap is to test how a user is interacting with a web site. What links are they clicking on? What advertising layouts produce the most earnings? There are some of the questions any conversion conscious webmaster should be asking. Essentially, by implementing heatmap testing over several days, we can monitor and change around the visual elements to continuously improve our website conversions. I have been using heatmap testing for the past two weeks on several websites including my blog. I first used it on my blog to track what visual elements were receiving the most attention and where readers were generally clicking. For example, one of my goals is to increase my newsletter signups. 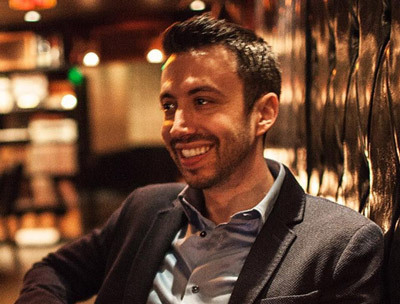 When I first started my heatmap testing, it became clear why I wasn’t receiving as many signups as I had hoped — the area around the signup box was receiving very little heat. I did notice, however, that my navigation bar was receiving a ton of heat. After learning this data, I decided to create the 3-column header graphic that shows my popular articles, newsletter signup and recent articles (shown below). My newsletter signups increased by 136% that week. I would have never made this change if it weren’t for my initial heatmap testing. Another heatmap test I did was on one of my Adsense sites that receives a ton of traffic. After analyzing where visitors were clicking, I removed two simple elements on the page and my Adsense earnings DOUBLED! Not bad for 5 minutes of work. I will write a post next week about the specific changes I made and a few other tips for improving CTR. As I mentioned earlier, heatmap testing is certainly one of the better web analytic tools I have come across. I strongly recommend everyone tries it out if for nothing more than seeing how visitors interact with your site. It’s good data to have and I am sure at some point in the future you will be able to put it to use. Here’s the good news: you can start heatmap testing right now, for free. Crazy Egg has a free version of their tool that allows you to test up to 5000 visitors/month from 4 pages. I went through my 5000 visitors pretty quickly, so I decided to sign up for the Basic plan which allows me to track 10,000 visitors from up to 10 pages. It also includes live reporting and some other advanced tools, only for $9/month. Not a bad investment considering I just used it to double my Adsense income from $25 to $50/day. This post was sponsored by Create Business Growth. I added your blog to MyYahoo last week after following a link from John Chow…I am impressed! Your content is sensational, we should talk about doing some cross promotion at my blog. I think I’ll have a try at this with my blog. Thnx Nate. I am a massive fan of Crazy Egg – I gave them a trial run back in May and from the data I was able to make my site even more user-focussed. I’m another Crazy Egg fan. Been using it for a couple of months. The data they provide on where a user clicks has been very valuable. In my case I found the sidebar attracted very little attention so that it is an area I will focus on improving next. nice post. i recently started using crazyegg and was very impressed by its result showing where clicks were made. i think every one should try it. I had this on my other blog and loved it. Thanks for the reminder to use it again. I was lucky enough to come across Crazy Egg during their BETA signup and they gave me a 10,000 pageviews account for free. I’ve used it a few times but I’ve yet to really exploit Crazy Egg to its full potential. I will be using it in the future though to really narrow down some details on a new site. I think it works best if you have a very specific question that you want answered by the data. Very cool. I’m going to try it right now. Yeah, Crazy Egg is a great service. I’m nowhere close to the limits of the free service, but I’m hoping to change that eventually and will be happy to pay for it. I’ve been trying to convert the unconverted at my soon to be job for many of the blogs. Amazing resource and truly shows what the hell visitors do. I like to try out crazy egg service, but the limit for free version is just to small. I now give clicktale a try. Oh that sounds sweet, I’ve got to try it. I’ve got a site that I would love to get that kind of information about. Too bad only the first 5000 visitors are free, but this sounds like it could improve click through so much that $9 a month would be nothing. Crazy Egg is awesome. Highly suggested! Pingback: Is My Blog Sidebar Ready For The Scrap Yard ?